The prospect of losing your hair can be overwhelming enough when undergoing chemotherapy, let alone hearing from your doctor that may lose your eyelashes, as well. Eyelashes are an important feature to most people, particularly women. They frame the eyes and, as with all hair, can be central to a person's self-image and sense of self-esteem. Hair loss (alopecia) is a ​common side effect of chemotherapy and isn't just limited to the hair on your head. It is not uncommon to experience hair loss on one's legs, arms, pubic hair, eyebrows, and, yes, even the eyelashes. It important to remember, though, that not everyone undergoing treatment will lose their hair. Each person responds differently to chemo, with some classes of the drug more likely to cause hair loss than others. The drug dose itself can also be a factor, with lower doses often resulting in less lost hair. The problem with losing your eyelashes is that it is not always easy to conceal if you want or need to. You may be able to cover your head quickly with a wig or a cap; false eyelashes are not so simple (and not a viable option for many men). Even more bothersome is the fact that eyelashes often do not fall out until well after chemotherapy has been completed. Moreover, some will experience the thinning or shortening of lashes rather than a complete loss, while others will go through recurring cycles of loss and regrowth. False eyelashes are an option that many consider but check with your doctor before using them. There is always a risk of infection when using these products, and some have been known to experience an allergic reaction to the glue. 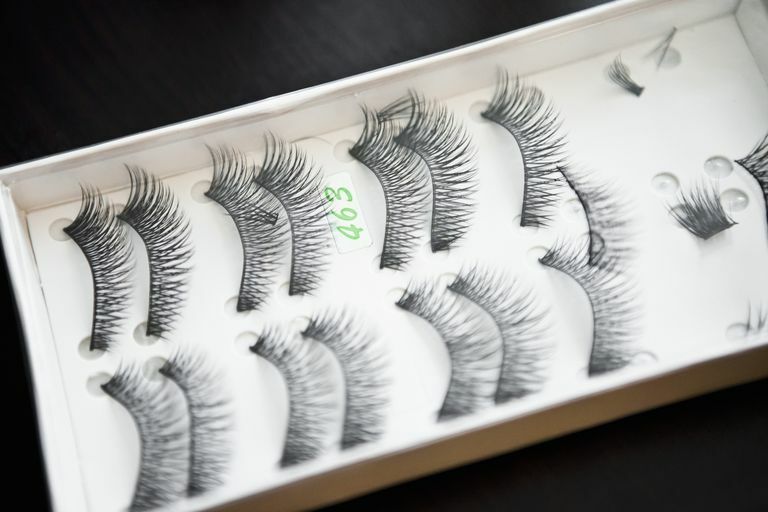 False eyelashes are available at most drugstores and cosmetic counters, costing anywhere from $3 to $100 a pair. Before putting them on, you should always spot test the glue on the inside of your arm to confirm that whether or not you have an allergy. If you have not used false eyelashes before, they can be a little tricky. This is especially true if you have no real eyelashes on which to situate the false ones. In this case, you may want to speak with someone at the cosmetic counter who can give you tips or even apply them for you. There is also a newer, topical treatment that may help. Latisse (bimatoprost ophthalmic solution) is an FDA-approved product used to stimulate eyelash growth and darkening. It is applied topically to the base of the lashes each night. Results can vary and are typically seen after eight weeks of use. As with the false eyelashes, you should check with your doctor or oncologist before use and always do a spot check on your arm. Insurance may cover the cost of Latisse but will most often require a pre-authorization letter or phone call from your doctor. Allergen, Inc. "LATISSE - Highlights of Prescribing Information." Revised September 2014.